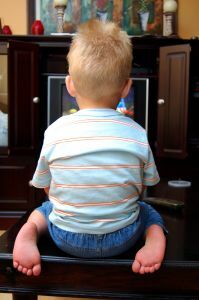 A study published in the Archives of Pediatrics & Adolescent Medicine has found a link between parents who interact less with their children while watching television and delayed linguistic development in kids between 8 months and 16 months. 329 children between the ages of 2 months to 2 years were kept under observation by researchers at the University of Washington and Seattle Children’s Research Institute. Digital recorders were attached to each child’s clothing on specific days over two years to record everything said by the children. At the end of the study period the results showed a seven percent decrease in words spoken by adults to children for each hour of TV viewing. The number of words these children uttered also decreased. The report said, “Having a television on within earshot of young children diminishes their exposure to adult words, their own vocalizations, and the conversational turns in which they engage.” However, the report does not suggest that TV time for kids is a bad thing. The core issue is that parents are responsible for developing their children’s language skills and watching television causes a substantial decrease in parent-child interaction. Instead of merely using the television as a babysitter, dads need to interact with their kids during TV time to ensure that the child’s development is not hampered.